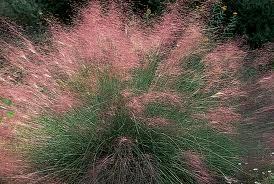 Masses of tall, delicate flower panicles create a vibrant rosy red haze over the fine textured leaves. Superior groundcover when massed with shrubs and trees. 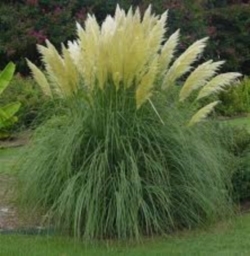 Adapted to heat, dry sites and poor soils. 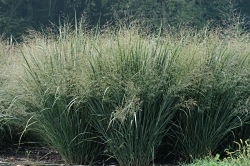 Deer resistant and drought tolerant. 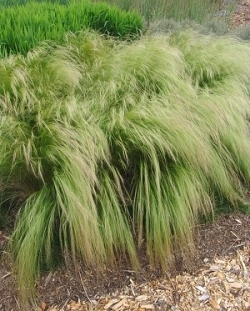 Green foliage is highlighted by dramatic horizontal golden bands. 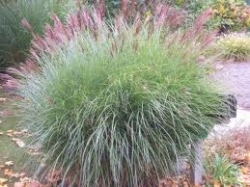 Reddish bronze plumes in summer. This smooth, blue tinted grass spreads slowly to form a clump. 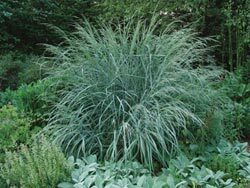 It is used for its glaucous blue color, and graceful fountain habit. It is adapted to dry, sterile locations where it plays an important role in stabilizing. 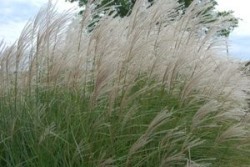 'Northwind' is a tall ornamental switch grass cultivar which features one of the best vertical forms. 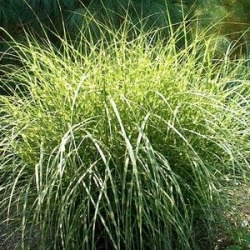 Olive-green to bluish-green foliage forms a compact, narrow 4-5' tall clump of foliage, which is topped in late summer by finely-textured mauve colored flower. 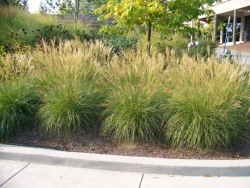 Foliage turns yellow-beige in fall and provides good winter interest.